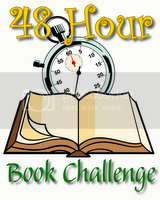 This is the first time I've done the 48 Hour Book Challenge (I've done the 24-hour read-a-thon a few times). And of course it's not the best weekend for me to spend reading non-stop, so I have low goals ~16 hours is what I'm shooting for. I'm starting it off by bringing my book to a doctor's appointment - that should give me plenty of time to read, right? I have lots of books I need to read soon, so that kind of decided my choices. Right now, I'm starting with The Lost Conspiracy by Frances Hardinge - it is huge. I've also got The Eternal Ones by Kirsten Miller for an ARC tour. My Name is Memory by Ann Brashares, Son of the Shadows by Juliet Marillier (also enormous), and Secret Speakers by K.S.R. Kingworth are all in the queue as well. Thus far I haven't done too well, but considering the many distractions, not too poorly. I'm not very good at staying up late and reading. However, I am up past my regular bed time, so that's pretty good for me. I'm still in the middle of The Lost Conspiracy and My Name is Memory. Hopefully I'll finish them tomorrow. So, enough talk, let's read! Good luck with your pile! I will be cheering for you. I'm going to cheat through this challenge and read without signing up officially. Mainly, I'm feeling lazy about actually keeping track of things and logging it somewhere. I just want to read. I've been doing some heavy reading all week, so the weekend will just be a continuation. That is, unless something comes up! Good luck! This is the first challenge of this kind I've seriously done and I'm enjoying it quite a bit. I love your rating system. Hope you get more reading time today! Melissa, I'm thinking I'll get closer to 20! Yeah! Suey, that sounds pretty good. I think next time I probably will do that as well. Lydia, they are so much fun! Amused, thanks - maybe next time? donna, thank you! Good luck in your reading as well.